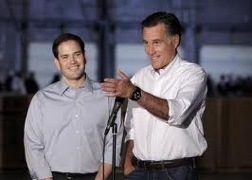 It sure seems Romney feels Rubio is his ticket to capturing the Latino vote. Of course, selecting Rubio as a VP running mate would be pandering to Latino voter in much the same way Palin, in 2008, was used to pander to women voters. Also, Republicans who are pandering to the Tea Party movement understand that if they continue to alienate this fast-growing population, Latinos, they’re going to make it harder and harder to regain majority status and certainly regain the White House. 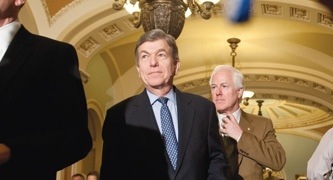 Why is Rubio a potentially disastrous choice? The two are a match made in pandering heaven. Rubio has been proven to be an embellisher and anti-Latino. 1. Rubio mislead voters about his family history to appeal to voters – until he was caught. He claimed to be the son of Cuban EXILES, not immigrants. Watch this video: Rubio caught embellishing his story Imagine Barack Obama trying to lie about his family’s history. The coverage would be staggering. 3. Rubio neither supports the policy positions held by large majorities of U.S. Latinos nor shares even the most basic values and views held by Latino communities regarding the issues they care about. Rubio is a Tea Party Partisan: Rubio owes his election to fervent Tea Party support, not to a broad base of Latino and other mainstream voters. Rubio has publicly aligned himself with the Tea Party movement, despite the Tea Party’s anti-immigrant views. 91% of Latinos favor the DREAM Act. Rubio is pandering once again by endorsing a veritable DREAM Act 2.0 which would be great for the GOP, but a nightmare for immigrants and their families. Obviously, Rubio is beholden to his Tea Party masters far more than his Latino roots. 4. 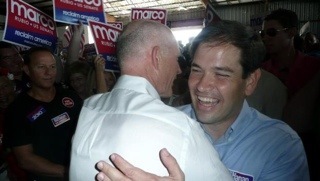 Rubio is a supporter of Governor Scott’s voter suppression campaign which disenfranchises poor Latino voters. We all remember the disastrous voting debacle in 2000 that brought us eight years of George W Bush. See Florida, How Quickly We Forget for more on voter I.D. laws. This guy is bad for America and even worse for Latino-Americans. Hopefully they can see that this November.